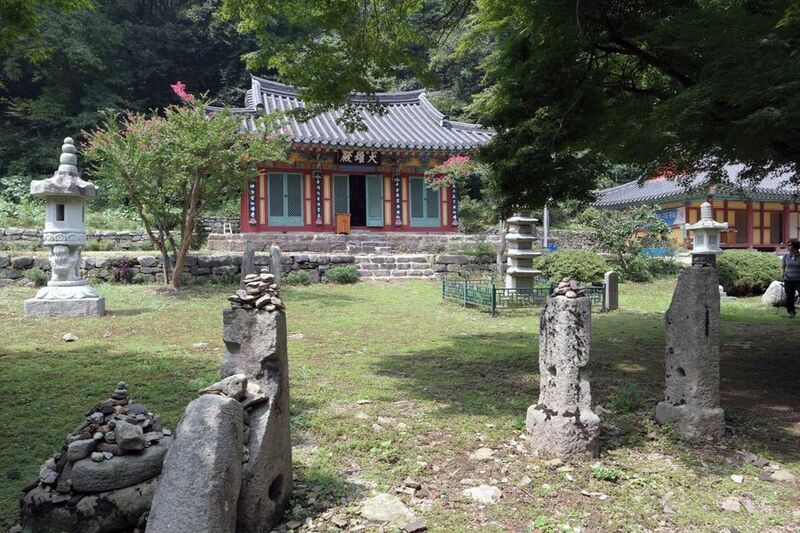 I walked for a bit and 「Gangcheonsa」 temple built in 887 by Doseon Guksa showed up beyond the stonewall. It was once very big temple with 1,000 Buddhist monks. However, it was destroyed during the Korean War and now only a few new buildings remain. It's too bad. 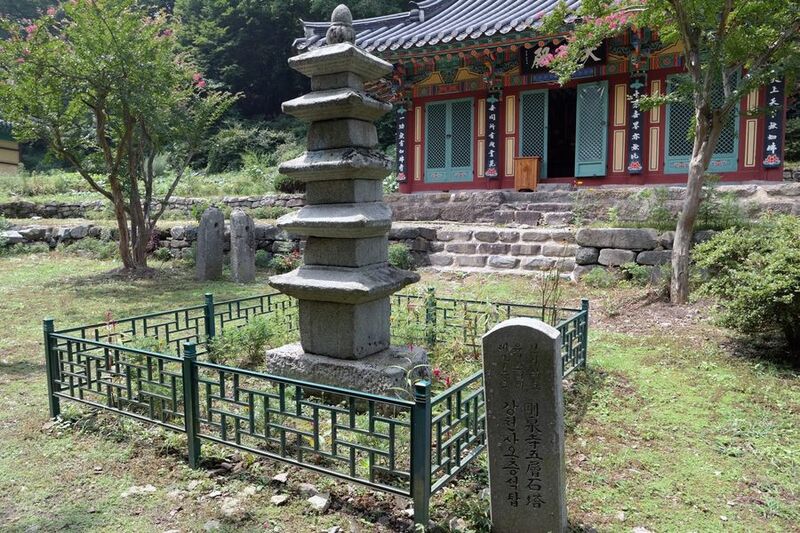 Things that are transmitted from the ancient are only Gangcheon Temple Five-story Stone Pagoda built in 1316 when Gangcheon Temple was rebuilt, as well as some stones including a flagpole support. On a closer view, you can find traces of bullet during the Korean War on the second, third, and fourth cover stones. 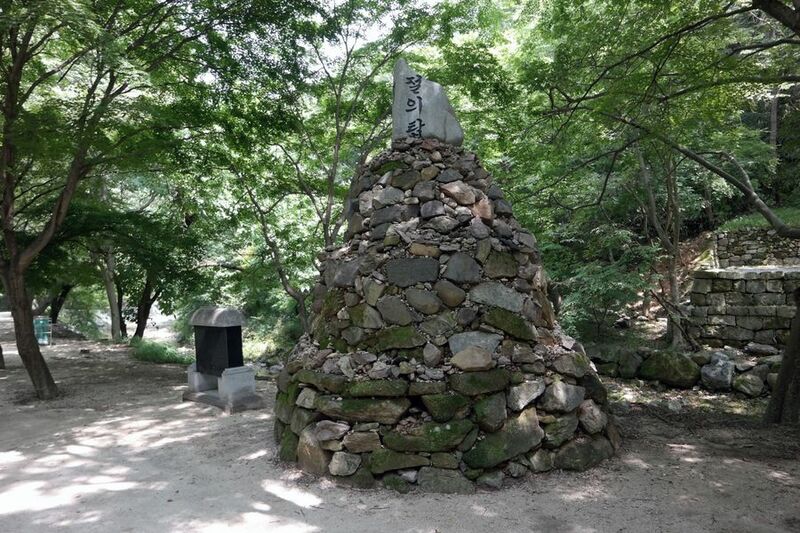 Sunchang has been called the Home of Fidelity, because there have been many patriotic martyrs devoted to the nation during Imjin War(Japanese invasion of Korea in 1592), Second Manchu Invasion of Korea(1636), and King Jungjong's Rebellion. It is told that the Jeoleui(Fidelity) Tower was built outside of the stone wall in the temple with stones from every where in the village to commemorate the fidelity. Across the bridge behind the tower, there is a monument house that represents another history of fidelity, 「Sunchang Samindae」. Samin means three seals. 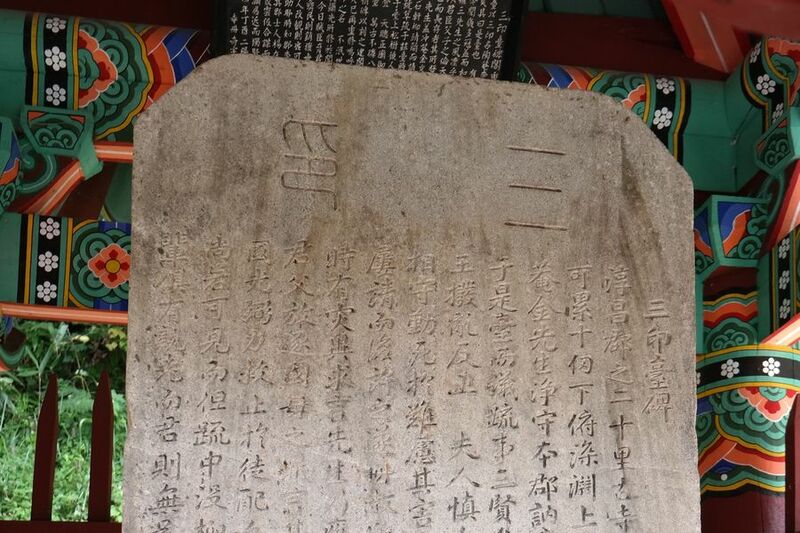 The monument was built to remember governor of Sunchang, Kim Jeong, governor of Damyang, Park Sang, and governor of Muan, Ryu Ok. 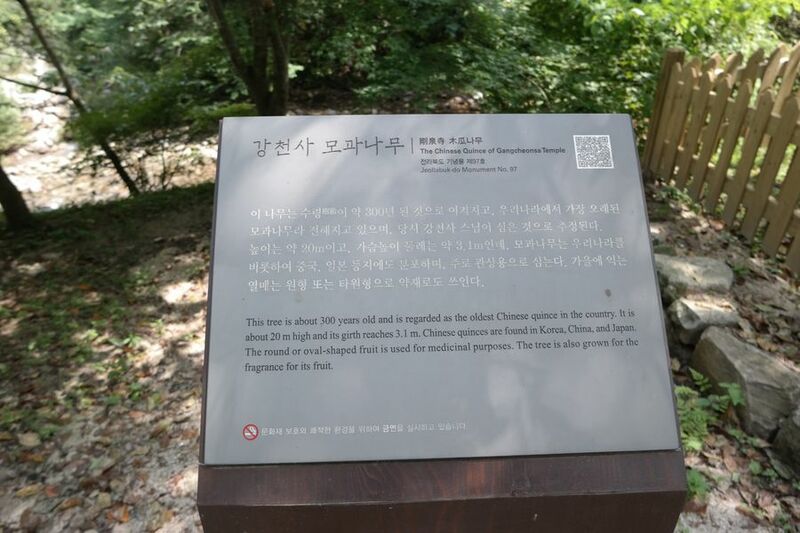 The story is that they hung their own seals on the branch of pine tree to appeal for the deposed queen lady of King Yeonsan, Shin's restoration and finally went into exiled. On the middle of the course, Gangcheon Temple, Samindae, Jeoleui Tower gathered together. 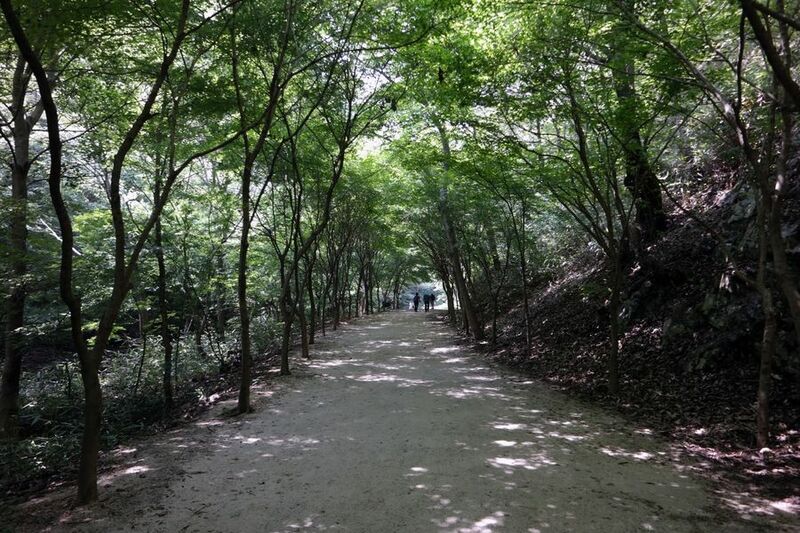 At the end, you can find another specialty, 「Gangcheonsa Quince Tree」. 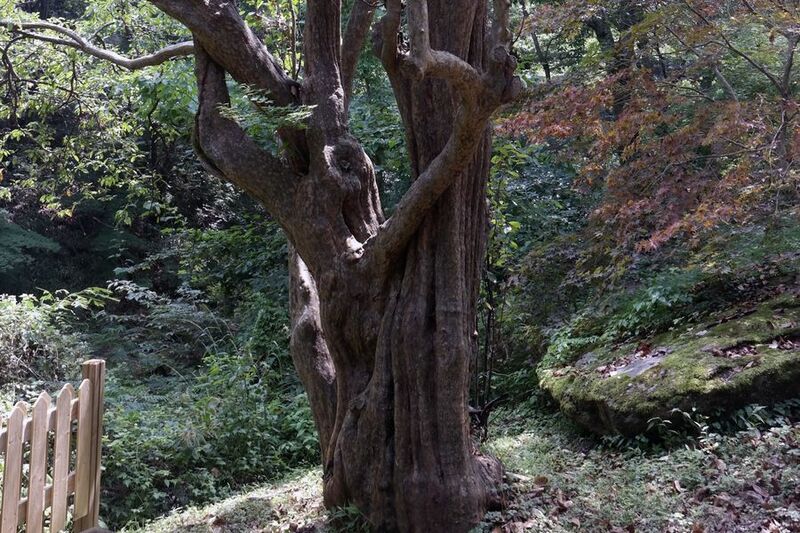 It's told that this Gangchensa Quince tree is the oldest quince tree in Korea. It's 300 years old. It's impressive that the tree has still green leaves and grew with a twisted shape rather than boasted its remarkable thickness. After a while, I faced to the steeper uphill road. “Oops… Oh God I'm not ready yet to go up this steep uphill road". This road is a necessary course, but I decided to stop by on the way down the mountain and turned our steps to the Gujanggun Waterfall. 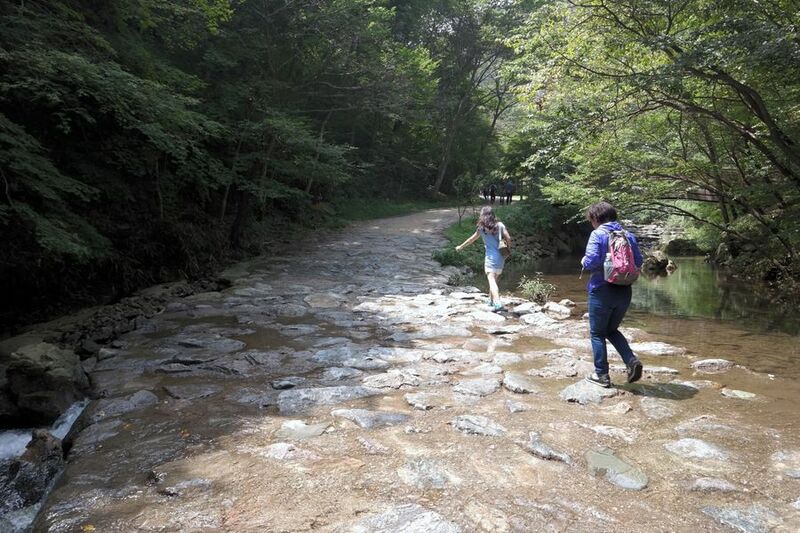 Here, level of the valley water is low, so sometimes I could cross a stream on stepping-stones. A bridge is also provided on one side preparing for the high level of water. The red clay road was getting narrow and I felt cozy due to the trees along both sides of the road. 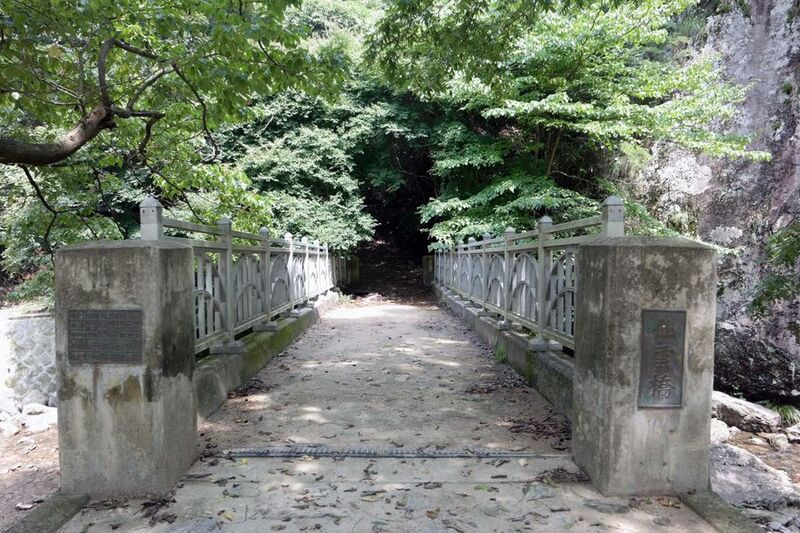 It's also good that the road became less crowded past the entrance of Hyeonsu Bridge. 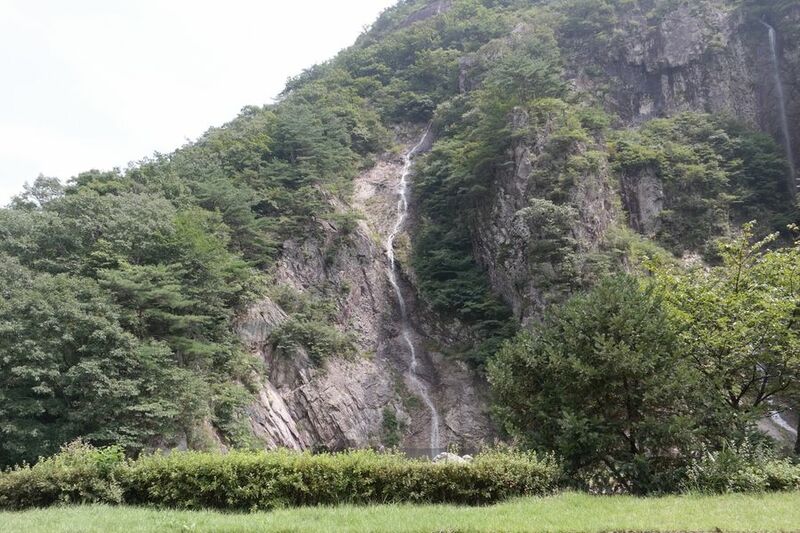 When we reached to the last destination, a huge waterfall showed up in front of us. You must not feel wonderful view as it is by a picture, but in fact, I was admired at its height when I faced to the waterfall. “Great~!!" 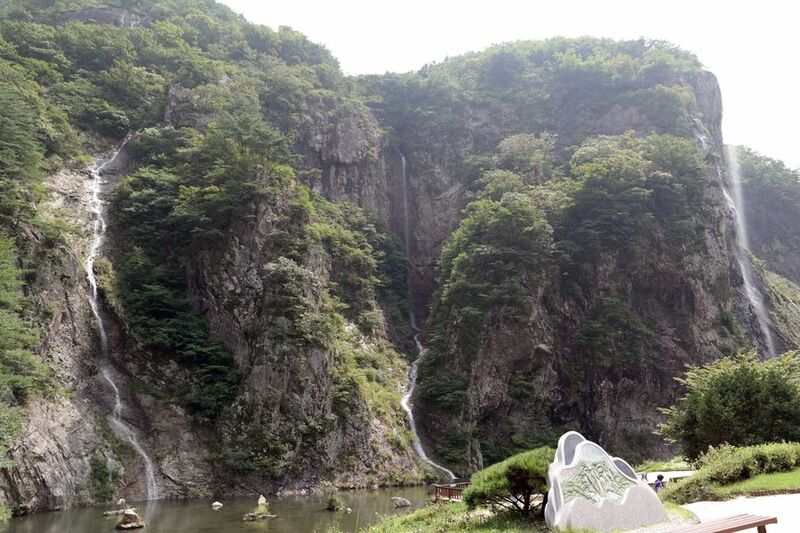 Here is 「Gujanggun Waterfall」 that presents the most wonderful view in the mountain. It has 120m long of three streams flowing down through strange rocks and bizarre stones. 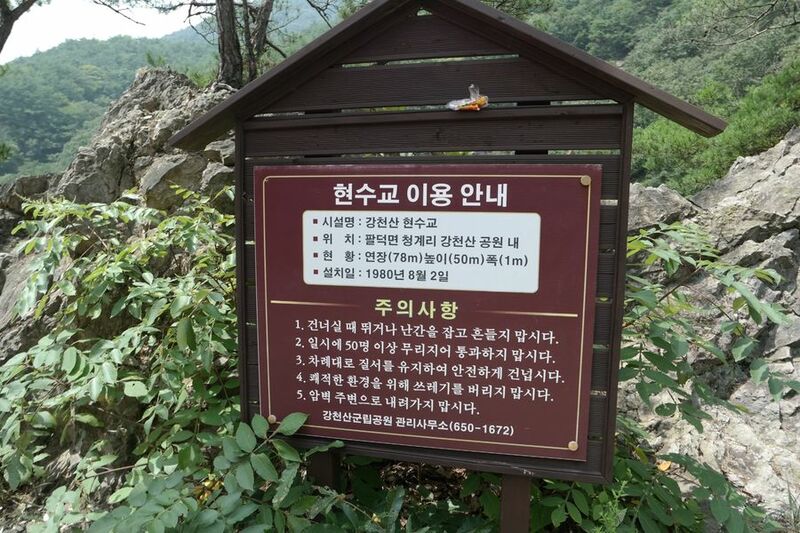 When I heard first of the Gu(Old)janggun Waterfall's name, I expected about Sin(New)janggun Waterfall, but it was not 'Old' Gu but 'Nine' Gu. 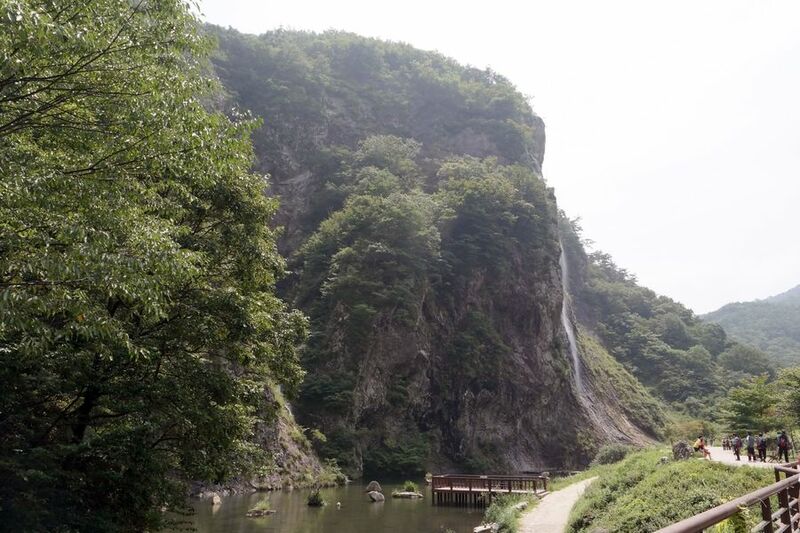 The waterfall has a legend about nine commanders' victory. The story is started with nine commanders who had formed a solid alliance with each other in Mahan dynasty before Baekje was established. They were defeated in the war and got to this waterfall. When they were about to kill themselves, they resolutely determined to die while fighting against enemies and finally won in the war. I was walking down for about 20 minutes and I found a long bridge that is across the blue sky and links green peaks from one to another. 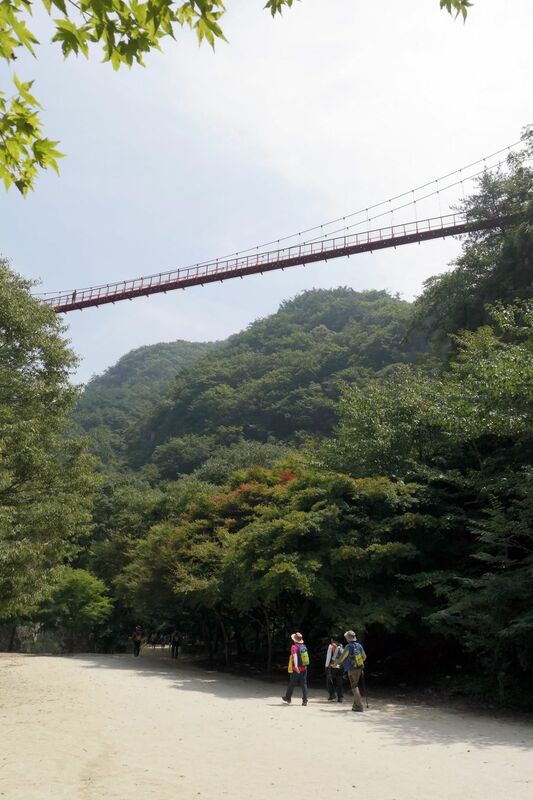 It's the 「Gangcheonsan Gureumdari(Gangcheon Mountain Suspension Bridge」. 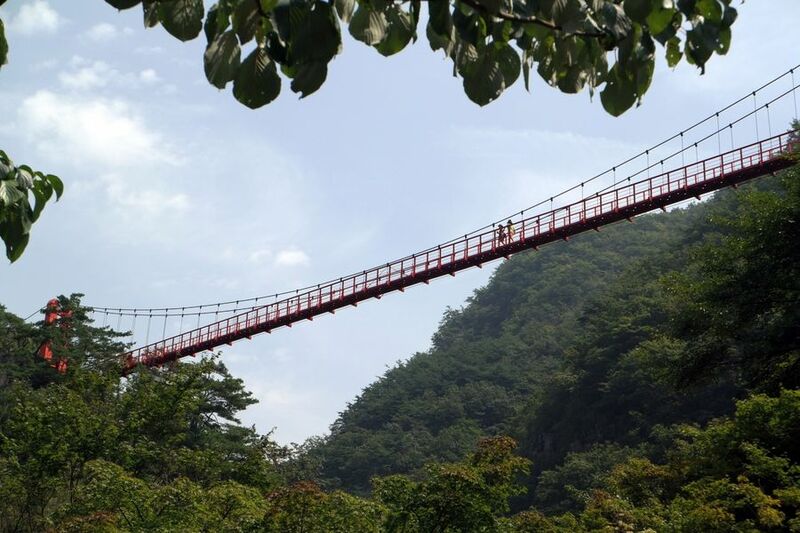 This Hyeonsugyo built in August, 1980, is 78m long, 50m high, 1m wide bridge. 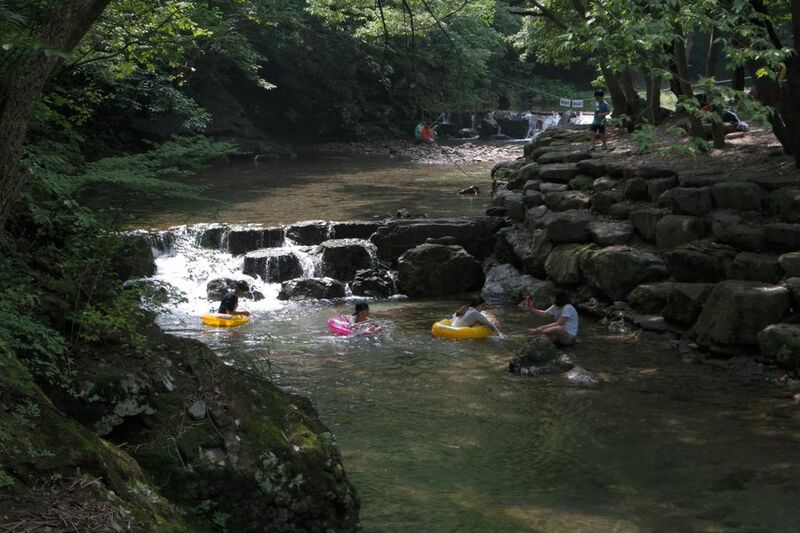 Now, it is more famous than the Gujanggun Waterfall and considered the number one specialty of the Gangcheon Mountain. 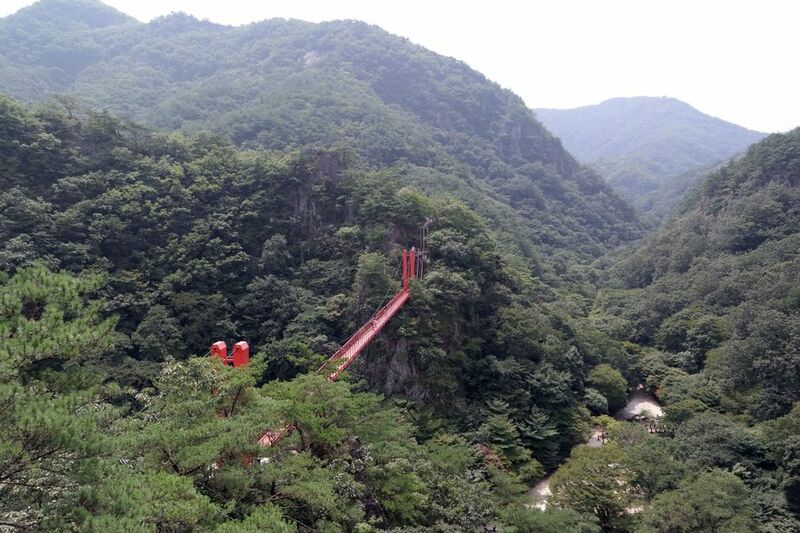 When you look at the bridge from the ground, you could see the iron floor which has many holes. It seems a real sky bridge. Ah… but the problem is I don't like standing on that high place…!!! 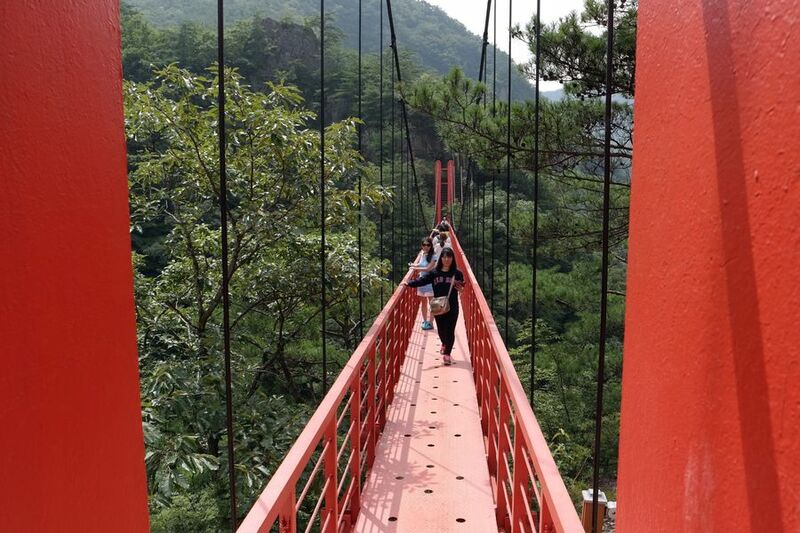 When would I come back here though~ I ended up stepping onto the Hyeonsu Bridge. 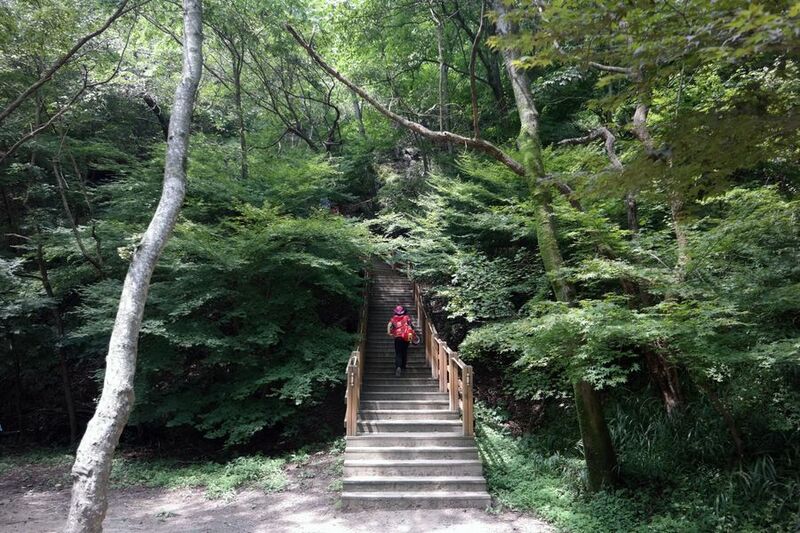 There were strong stairs, but we chose opposite stairs which is closer to the Gujanggun Waterfall. We were standing in front of Seonun Bridge as though it was hidden in the corner. “Yipe~!! "Very steep iron stairs were all covered with rust and looked shaky and dangerous. 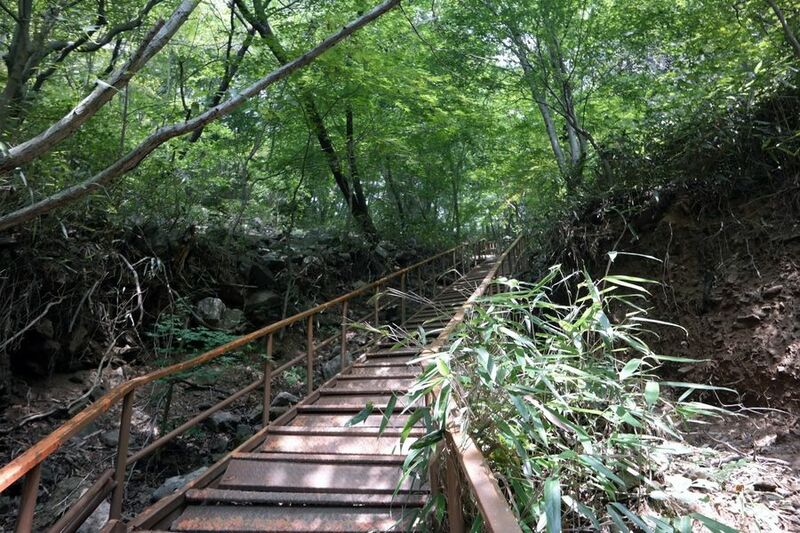 The stairway was surrounded by rich trees and the soil was collapsed all around. These made dark and gloomy atmosphere over here. Finally I kept walking up looking at my feet and uh... It seemed I came up too much. I realized I came up to the observatory. 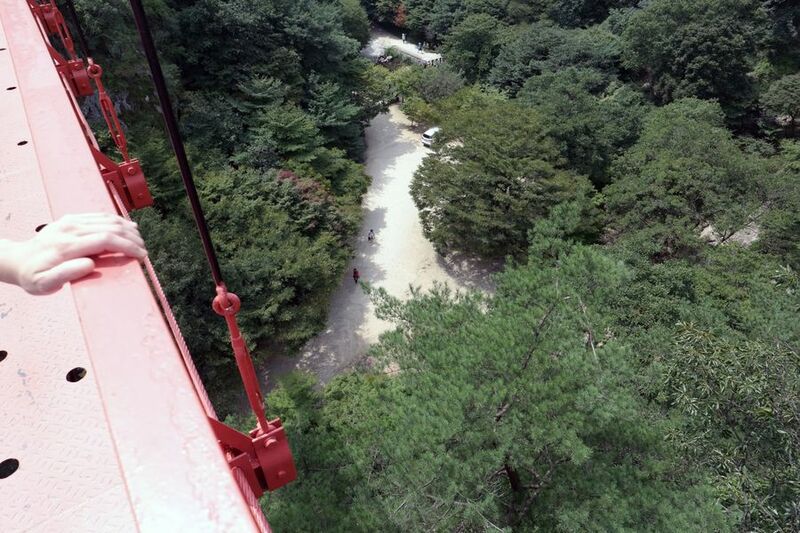 There is a red Hyeonsu Bridge far below. 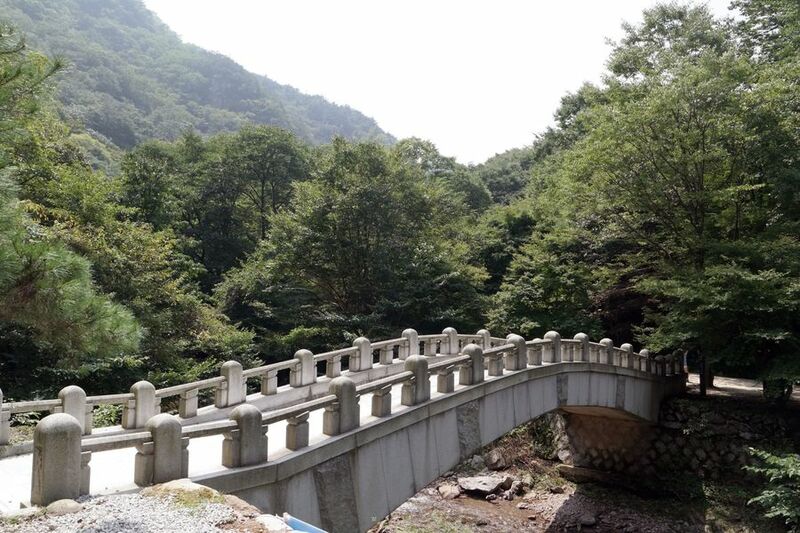 Let's take one more breath and go to the Hyeonsu Bridge. Go~. 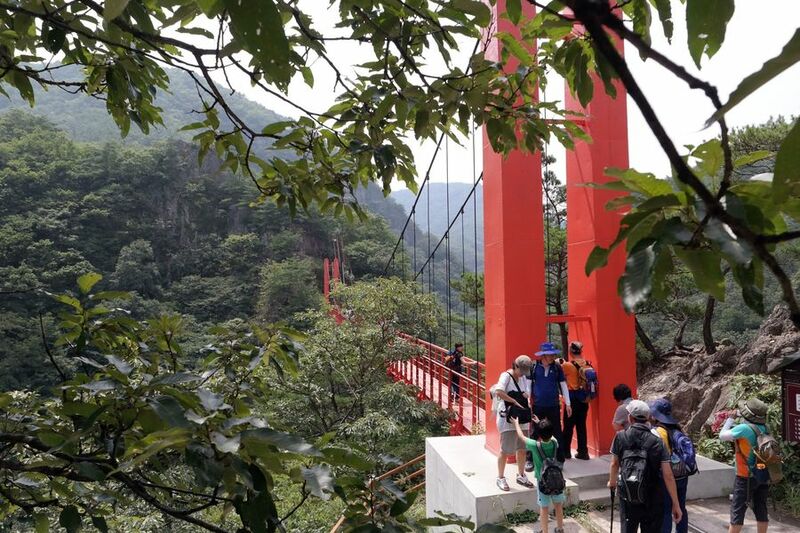 Many audiences already gathered together at the suspension bridge. 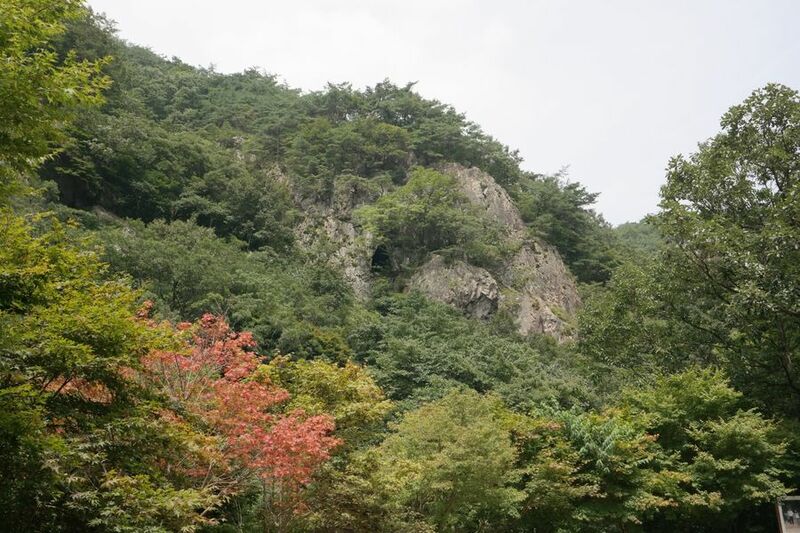 Usually people come to the Gangcheon Mountain in order to watch it. The Second point on a caution sign particularly offends my eye. I'm kind of heavy so regard me as 2 people… My brain started to do a complicated calculation. My Chodingi is already standing on the middle of the Hyeonsu Bridge. She has no idea how nervous I am; she motions me to come closer. Looking at the bridge, I felt courage suddenly surged up within me. I started to move forward step by step. Oops… As towering pillars at the entrance disappeared, my courage dissolved and I'm in the completely different world. 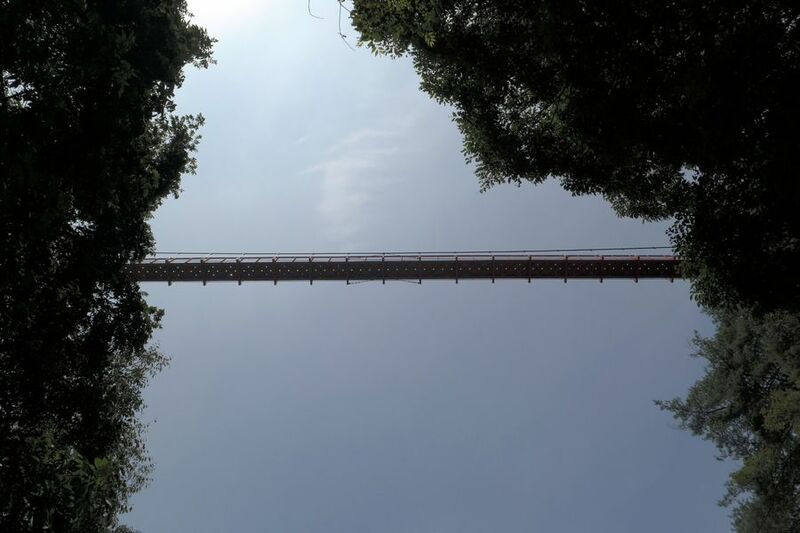 The suspension bridge started to be wobbled when I was shaking out of fear. Oh my God~!! It's probably because the bridge swung in the wind, anyway I felt like I was walking on a big cloud. I looked down from the guardrail and I found visitors small as ants. My courage didn't exist any more. I didn't cross even half of the bridge, but I quickly left there by saying “Ah~ I suddenly remember that I left something at home~", and rushed down the opposite stairs. 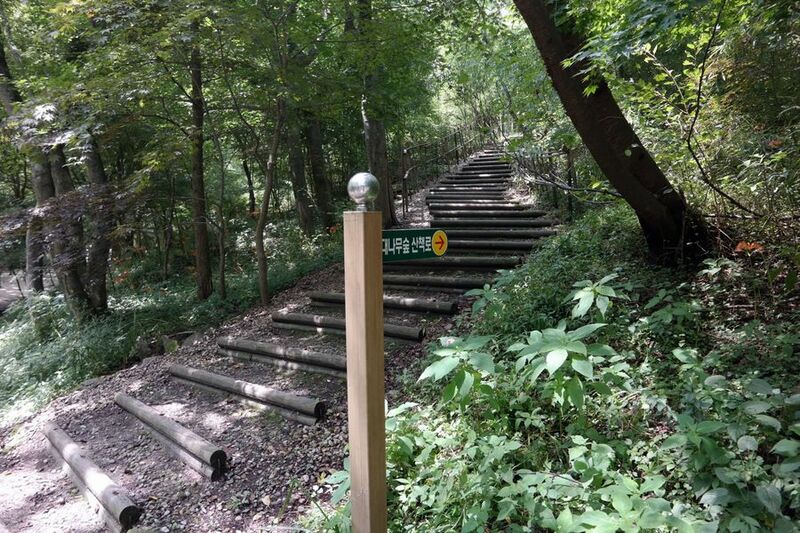 Fortunately, I felt secure on this road which is made of strong wooden deck, because people go up and down these stairs. On the way down, I felt so cool beyond thinking of the heat. 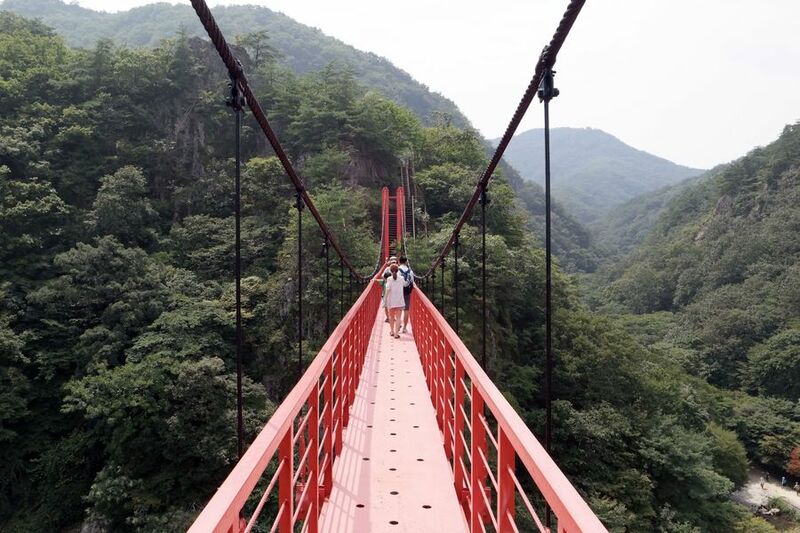 I don't know if it's because of the view of the valley that I watched for a long time or much spray of the waterfall, or fear of the suspension bridge(Perish the thought). 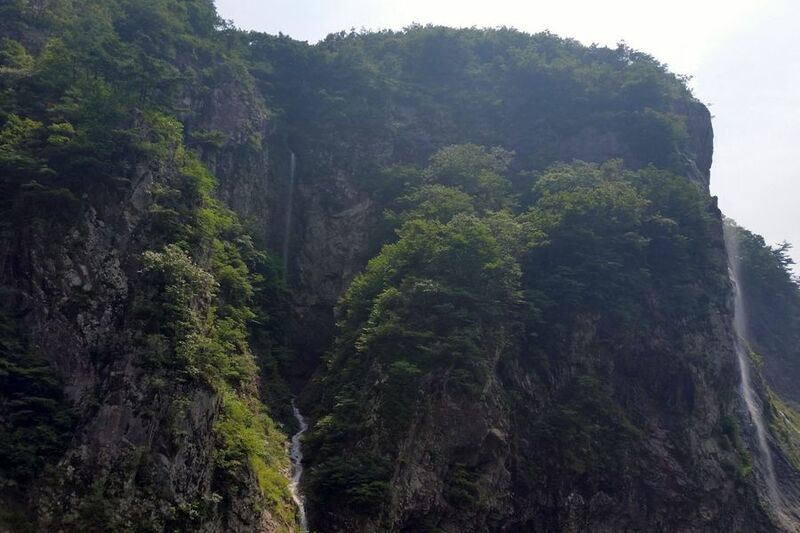 At the Gangcheon Mountain in Sunchang, even though I didn't get into the water of valley, I felt full of coolness and freshness of green. I had grown up in the country that had many valleys, so I used not to be admired of usual valleys. 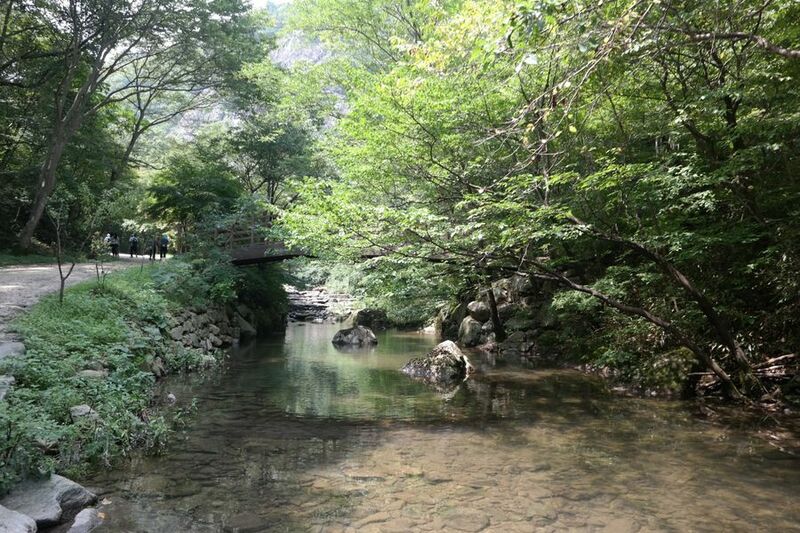 However, this valley in the Gangcheon Temple was so wonderful that I promised myself to come here again and take a rest soaking my feet into the water. 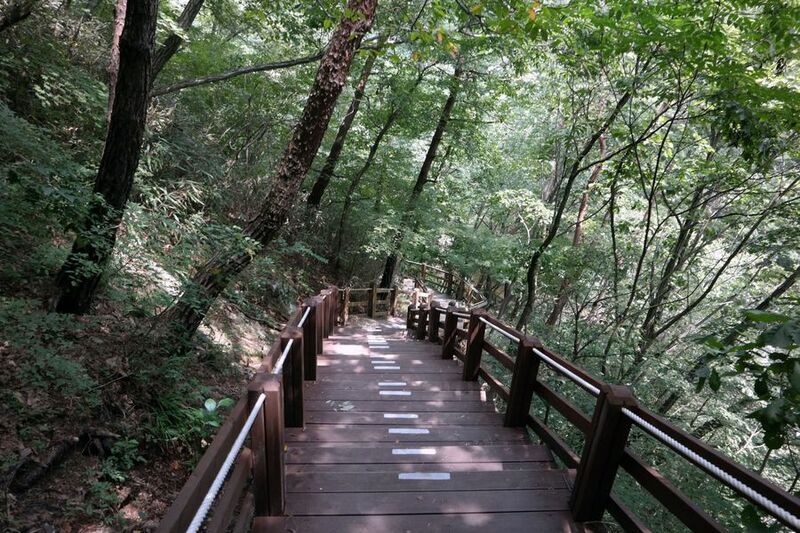 It will look different each season, but I recommend you to visit this 「Gochang Gangcheon Mountain County Park」 in the summer rather than other seasons.